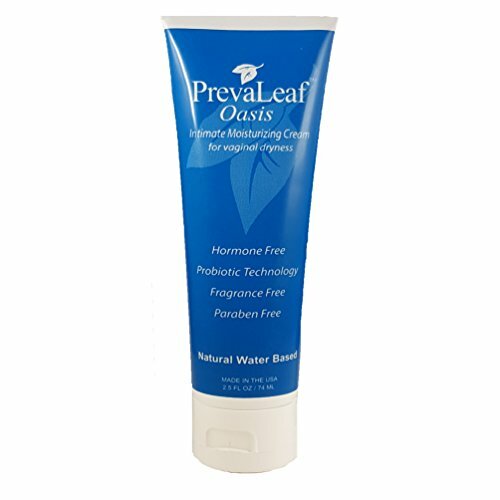 PrevaLeaf Oasis is a water-based natural vaginal moisturizer specially formulated to ease symptoms of intimate dryness. It contains natural ingredients, probiotic technology (NataPres Gs), is pH balanced for the vaginal environment, fragrance free, paraben-free, hormone-free, rapidly absorbing and non-messy. Each 10 ml. airless-pump provides a 1 month supply (30 applications). Dermatologist and Gynecologist tested and approved. PrevaLeaf Oasis Daily Intimate Moisturizer is a water-based intimate moisturizer that is specially formulated to ease symptoms of vaginal dryness. PrevaLeaf Oasis is paraben-free, hormone-free, fragrance-free and pH balanced for the vaginal environment. It is formulated with natural ingredients, water-based, rapidly absorbing, non-messy with probiotic technology (NataPres Gs). Concentrated - A little goes a long way. Dermatologist and Gynecologist Tested & Approved. All PrevaLeaf product ingredients are carefully evaluated based on criteria determined by organizations such as the Environmental Working Group and Natural Products Association. Always go to your health professional if symptoms persist or you are experiencing abnormal discharge. If you have any questions about this product by PrevaLeaf, contact us by completing and submitting the form below. If you are looking for a specif part number, please include it with your message.